Diving into a discussion about the U.S.-China trade war is a tough business, so allow me this caveat: anything can happen, especially with our current administration. Nevertheless, those who are seeking to capitalize on the best stocks to invest in may be onto something. First, the obvious statement: neither side wants to budge an inch. On the one hand, decades of superior economic growth emboldened Chinese pride and nationalism. Naturally, this sentiment has translated into a significant military buildup. Backing down means losing credibility, something the Chinese leadership cannot afford. On the other hand, the U.S. must protect its intellectual property and its national-security interests. According to author and noted China critic Gordan Chang, controversial tech company Huawei stole technology from Cisco Systems (NASDAQ:CSCO) and T-Mobile (NASDAQ:TMUS). Furthermore, Chang claims that the Chinese government and military supported Huawei’s thievery. Under normal circumstances, we should not expect an imminent resolution, confusing matters about what to invest in now. However, we don’t live under any sense of normalcy. Plus, headwinds on both sides suggest the best course of action is a workable truce. Despite their recent fiery rhetoric, the Chinese government harbors serious fears. The latest economic data indicates declining growth, job losses in U.S.-tariff targeted industries and deteriorating consumer sentiment. Moreover, the ultra-rich are getting increasingly tense about future economic prospects. For Americans, we’re on the verge of unprecedented instability unless the government shutdown ceases. Additionally, President Trump and the Republicans have a political incentive to negotiate a truce with China. Scoring a victory here means assuaging the electorate, many of whom have turned their backs. Among Chinese stocks, none get more attention than dominant tech giant Alibaba (NYSE:BABA). After a series of bumpy trading following its initial public offering, BABA stock skyrocketed in 2017. Around the middle of last year, Alibaba appeared on track to make a repeat performance. Unfortunately, the escalating U.S.-China trade war derailed the company, knocking it off its perch as one of the best stocks to invest in. That said, BABA is enjoying a strong start to the new year, gaining over 16%. Of course, Alibaba also posted strong numbers in January 2018. But for those seeking what to invest in now, the tech giant’s troubles offer an enticing entry point. As our own Dana Blankenhorn argued, Alibaba offers underappreciated cloud solutions. Combined with U.S.-China optimism, BABA could surprise in 2019. Another one of China’s best stocks to invest in, internet stalwart Baidu (NASDAQ:BIDU) has grown exponentially since its 2005 IPO. It, too, suffered a few years of choppy trading until it regained decisively bullish momentum in 2017. While it got off to a turbulent start last year, optimists hoped for a repeat performance. Unfortunately, the U.S.-China trade war had other ideas. Moreover, BIDU stock was particularly affected by the ensuing volatility. In the second half of 2018, shares dropped a staggering 33%. For speculators eyeballing what to invest in now, BIDU stock has substantial upside potential. Unlike other Chinese companies, Baidu has yet to enjoy a noteworthy dead-cat bounce. Therefore, you’re getting the internet firm close to the bottom. Of course, the caveat is that we’re assuming no other economic or geopolitical event suddenly dampens enthusiasm. That’s a big risk, but the rewards may justify it for adventurous investors. Tencent (OTCMKTS:TCEHY) follows a familiar trajectory with its Chinese compatriots. Following a dramatic rise against its IPO, Tencent’s mercurial rise slowed noticeably between 2014 and 2016. However, 2017 produced a monster result for the popular internet-services company. Unfortunately for shareholders caught up in the enthusiasm, TCEHY stock peaked in January of last year. Since then, it has largely been a downhill slide. Overall, Tencent lost more than 26% in 2018. But what makes TCEHY one of the best stocks to invest in is momentum. Since hitting bottom on Oct. 29, shares have jumped more than 33%. More importantly, the bulls have carried this enthusiasm into the new year, moving toward double-digit territory. While you’re not getting the biggest discount with Tencent, you’re receiving in its place more stability and confidence. Plus, a diplomatic headway will almost surely attract a surge in investor dollars. At first glance, China Green Agriculture (NYSE:CGA) doesn’t meet the criteria for what to invest in now. For starters, CGA has become a veritable penny stock, with shares currently trading for less than a can of soda. Plus, the U.S.-China trade war directly and negatively impacts the agricultural industry. But as a contrarian, CGA is also a candidate among the best stocks to invest in. The reason? Fundamentally, it can absorb many of the troubles associated with the U.S.-imposed tariffs. Management is sitting on $153 million in cash, while it only has $7.2 million in debt. Despite obvious pressures, CGA has enjoyed consistently positive free cash flow. Still, a resolution will go a long way. The tariffs have negatively impacted growth. In its most recent quarter, CGA suffered a 6.6% decline in revenue year-over-year. But based on its price action, we may have seen a bottom. Should we enjoy a breakthrough in the trade war, Chinese companies won’t be the only ones to benefit. Several American organizations, including Skyworks Solutions (NASDAQ:SWKS), offer plenty of upside potential. As a manufacturer of smartphone components, Skyworks is heavily levered towards China. According to CNBC, 83% of its revenue originates from the world’s second-largest economy. Based on that statistic, it’s no surprise that SWKS stock tanked last year, giving up 29%. That said, Skyworks is enjoying a positive start to the year, gaining 5%. This sets up an intriguing case for speculation. On one hand, the company has likely suffered severe damage due to the trade war. China is the biggest smartphone market in the word. On the other hand, SWKS will easily become one of the best stocks to invest in following a truce. Like the other names on this list, it’s a tough call, but the possible rewards are tempting. From a glance at its technical chart, Qualcomm (NASDAQ:QCOM) doesn’t belong on a list for what to invest in now. Last year, QCOM stock lost shareholders 8% of market value. Even worse, since peaking around mid-September, the tech giant has slipped more than 26%. Of course, Qualcomm is a major player in the smart-device sector. Therefore, the ongoing U.S.-China trade war levers an onerous headwind. At the same time, if American and Chinese leaders agree to a practical solution, QCOM would suddenly look attractive. More importantly, Qualcomm has other avenues to explore, namely the 5G rollout and autonomous-vehicle technology. The former is already a reality: we’re just talking about when global integration occurs, not if. The latter component is a little trickier because autonomous vehicles will take time to implement. However, QCOM does have reasonable assurances of a long-term revenue stream, which helps buffer the trade-war waves. When the international community greenlighted China’s insatiable thirst for all things tech, semiconductor firms flourished. But now that the U.S.-imposed tariffs dampened enthusiasm, companies like Micron Technology (NASDAQ:MU) are feeling the heat. Its price chart tells you all you need to know. In the first half of 2018, MU stock was cruising to another outstanding year, gaining over 25%. But the second half told another tale, with shares sliding over 38%. With neither side budging, Micron ended last year down nearly 24%. Betting on diplomacy isn’t the safest thing to do, especially with the Trump administration. However, an unexpected breakthrough could make MU one of the best stocks to invest in. Currently, the company generates over half its revenue in China, so a truce is crucial. With the world’s two largest economies going at it, you’d think international airliners would stall. However, United Continental (NASDAQ:UAL) has surprisingly been one of the best stocks to invest in. Last year, UAL stock returned a surprisingly robust 23%. As it turns out, diplomatic troubles don’t always translate downstream. Demand for flights to Asian countries have performed relatively well. Moreover, UAL has witnessed a surge for European travel, as well as domestic routes. Plus, a steep decline in fuel prices for the final quarter of 2018 provided an earnings boost. All that said, if UAL wishes to see continued momentum, a truce holds the key. On average, a Chinese tourist spends nearly $7,000 in the U.S. Therefore, sustained tensions between the two countries along with economic damage won’t do our tourism industry any good. 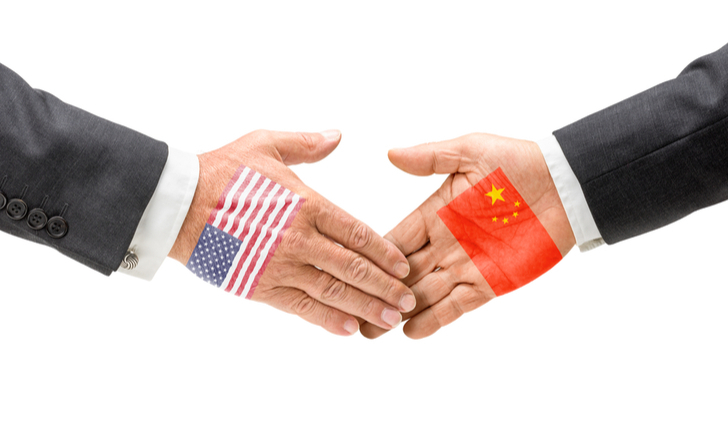 Article printed from InvestorPlace Media, https://investorplace.com/2019/01/best-stocks-to-invest-in-us-china-trade-war-thaw/.